The Tembo Tusk Skottle is a wok-style skillet that can be used for a wide-range of cooking. Even though I usually bring a grill camping, the Skottle has quickly become my favorite camping essential and I use it for most meals that require cooking. The Skottle comes pre-seasoned so you can begin cooking immediately. 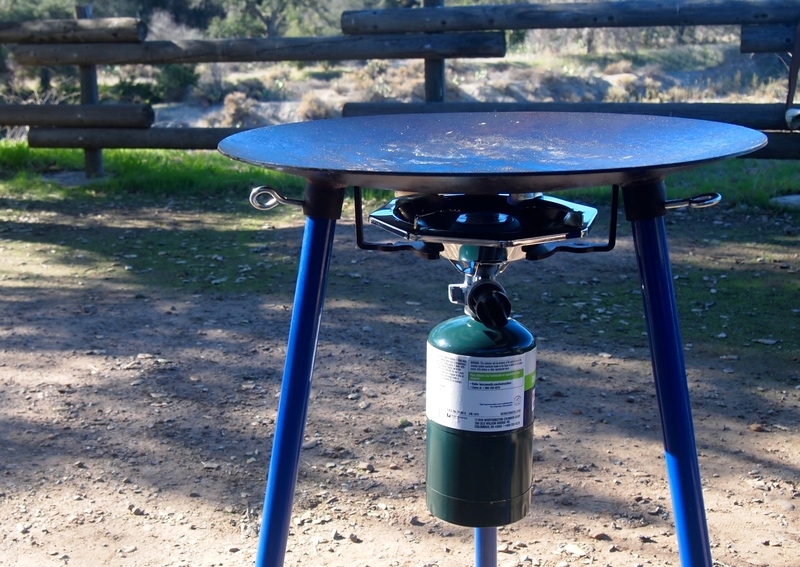 It is held up by three detachable legs and uses a Coleman-style burner as its heat source. The burner is sold separately unless you buy the complete Skottle Grill Kit. The Skottle uses disposable 16 oz. propane tanks but can be adapted to use a larger tank. Due to the shape and heating source, the center of the Skottle is where most of the actual cooking takes place. The outside area is perfect for keeping food warm while cooking in the middle. I usually cook veggies or bacon and then leave them on the outside to stay warm while I cook the main course. Setting up the Skottle takes less than 10 minutes. After I set it up the first time I usually leave it until we pack up to leave. Dimensions: 28 x 7 x 18 in. The number one thing I like about the Skottle is how versatile it is. You can cook pancakes and bacon for breakfast, and tacos or stir fry for dinner. There aren’t too many things I haven’t been able to cook on the Skottle that require a pan or grill. One of my favorite things to whip up is a breakfast hash. When I am camping, I don’t like to spend a lot of time setting up, breaking down, and cleaning. 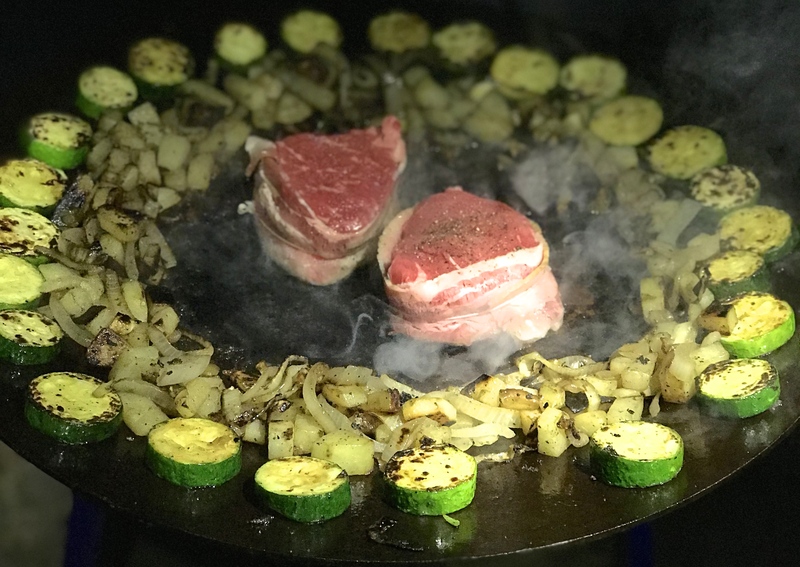 With the Skottle, I am able to fire it up and start cooking within minutes and clean up is super quick with the non-stick surface. The size, shape, and weight make it awkward for travel and storage. I would recommend getting the carrying case to help with those issues. It’s definitely not something hikers or light packers would or could use. The Skottle’s legs could also be improved. They are not adjustable which makes even surfaces a little difficult to work with. 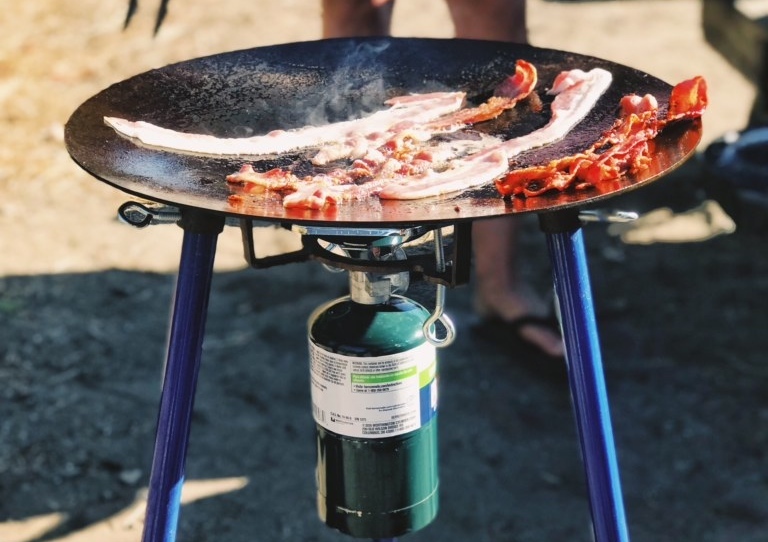 Tembo Tusk’s Skottle is an overall awesome and versatile device for all types of outdoor cooking. The size of its cooking surface is big enough to make food for groups of all sizes and its non-stick surface makes cooking all types of food fun and easy. There is definitely room for improvement regarding the size and legs but Tembo recently began manufacturing a smaller and more compact sized Skottle to help with lighter packers.